REVIEW: While the concept of a music keyboard with a computer inside isn’t entirely new, the folks at Austin, Texas start-up Music Computing think they might have invented the new sweet spot in bridging the gap between the notebook and controller crowd and the people who won’t use anything other than a Yamaha Motif or Roland Fantom-style workstation keyboard. Company founder and CEO Victor Wong is no stranger to computers and music having been the former CEO of Open Labs, as well as having had numerous stints at tech companies including an authorized Macintosh clone company, and value added resellers (VARs). For the new company, his team has addressed a number of shortcomings with other PC-based music products out there, a couple of which include price and portability. Having owned quite a few PC powered systems myself, including a Muse Receptor, two Open Labs NeKo models (TSE and XXL), a Korg Oasys, and even a Hartman Neuron, I seem to fit into the target audience for this kind of thing, and sure enough, I was one of the first folks to order one of Music Computing’s new keyboards (customer #8). The new StudioBLADE line of “keyboard production stations” follows somewhat in the footsteps of what competitor Open Labs has been doing for a while now with their NeKo and MiKo systems, but ironically tries to be more “open” in their approach to design and physical construction. They are smaller, more compact, and weigh less than either a NeKo, or even a Yamaha Motif XF6, thanks to lightweight aluminum, and not over-complicating the internals. Powered by Microsoft Windows 7 64-bit, the StudioBLADE comes pre-installed with the Presonus Studio One DAW application (full version, with mastering support), as well as a couple of proprietary VST instruments. First, SonicSource emulates the sound library you might find in a modern ROMpler, but with 8GB of sounds (more than 8x the sample data what comes with a Motif, by the way) as well as TriggerGrid, which is a drag-and-drop drum and sampler sound environment that works with the built-in grid control surface. Out of the box, the StudioBLADE 61 is a shiny and surprisingly compact keyboard roughly 36-inches long, 18-inches deep and about 4-inches thick when the 10-inch USB-powered touch panel is not deployed. The unit is compact enough to fit on a classic Ultimate Support Apex stand (using the longer support bars for depth). In addition to the 61-key synth action keyboard (made by M-Audio), the top area contains one of the most diverse control surface set-ups this side of a couple of Novation controllers having intimate relations. Specifically, there are nine vertical rows, each with a long-throw fader, two light-up push buttons, and four rotary knobs (see photos). 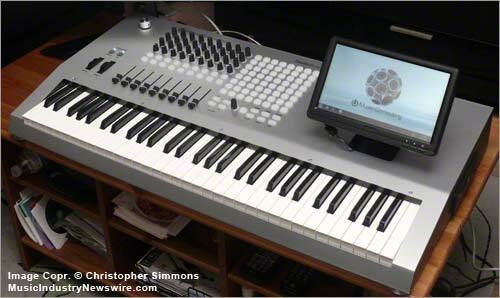 An 88-key version is also available with the same action (not a graded, hammer-action full piano keybed). The rotary knobs light up as you turn them, and work almost identically to the Livid Instruments OHM and CODE controllers. I would go so far as to speculate (due to the shared locale of Austin, and identical feel) that Livid might be providing parts to Music Computing for their controllers, but the company would not confirm this. In any case the controllers all feel solid and well built, and feel the same as my buddy’s OHM64, which is to say they feel really good. To the right of this is an 8×8 grid of lighted pads, which can either be used for triggering samples like an MPC or loops in Ableton Live fashion. There is also a set of bank buttons (more on that in a minute), transport buttons, and a rotary push selector knob. All this is well organized to be easily at hand for live control, and breaks with the “screen in middle” ergonomics of most other workstations. Having the control sections side by side, versus on either end, does seem to make sense when you actually use them. I particularly like the bank buttons, which will be familiar with anyone who ever used an Akai MPC with banks for sounds (A, B, C, D). Same idea. Except what’s wicked cool here is that you could have bank A be your DAW control to setup a mix in a live setup, such as levels for mics or a guitar direct input, then while performing jump between bank B for your Ableton control, while perhaps jump to Bank C where the faders become drawbars for your virtual Hammond B3, and maybe jump to bank D for controlling external lighting. Lots of possibilities there and first time I’ve seen that on any controller keyboard. In my case I put a 23-inch Acer touch panel display behind the StudioBLADE and this proves an ideal setup with Windows 7 where I don’t need to use the mouse for many things. The built-in touch panel setup in Windows 7 took literally one minute and didn’t interfere with the 10-inch display (see photos). In Studio One, the on-screen faders snap to the location of the non-motorized faders on the control surface, and while motorized faders might be nice, keep in mind the Euphonix control surface I have for my Mac cost $2500, or about the same price as the base model StudioBLADE. Additionally there is a quite snazzy machined aluminum master volume control knob along with keyboard octave up/down buttons and the typical pitch bend and modulation wheels. These wheels snap back a little slower than the Fatar-type wheels, but still work well. A wireless RF keyboard and mouse is also included. Pricing starts at $2599 “well equipped” for a Core2 Duo base configuration and $2799 for a Core i5 base configuration with 4GB of RAM and one hard drive. Upgrades include more audio ins/outs (not needed for many folks working inside the box only), and a larger or second hard drive. You can upgrade the HD yourself later if you wish by simply unscrewing some machine screws for an access panel on the bottom which is a mounting plate for up to two hard drives. One mis-informed forum troll posted something the other day about how the Music Computing units only had open source sound tools and you’d need to buy stuff to actually use it. Well, I’m here to say that is nonsense from somebody who cannot read or research what he was talking about before opening his big yap. In fact, the version of the Presonus Studio One which is pre-installed and configured is not a cheap open source or “bundled” app found everywhere, but a $400 commercial “pro” level application. It even supports the latest VST 3.1 format, can take ReWire connections, and comes with a host of proprietary virtual instruments, FX plug-ins, and pro level mastering tools. It supports delay compensation, time stretching, and all the things that the “big boys” promote as must-have features. Studio One includes: Impact, a sample trigger/drum instrument; Mojito, an analog-modeling subtractive synth; Presence, a sample player; and SampleOne, a full-featured sampler to create your own instruments with. A really gigantic overview of Studio One can be found on the Presonus website, here: http://www.presonus.com/products/SoftwareDetail.aspx?SoftwareId=11 . Worth noting is the fact that you can launch the DAW as either a 32-bit or 64-bit host, for compatibility with older plug-ins that won’t load in a fully 64-bit DAW host. One touch buttons on the touch screen lead to either version, depending on your needs. Additionally, it’s worth noting that Music Computing’s in-house sound instrument, SonicSource, is apparently based on the mature and highly regarded Wusik platform, and specifically the EVE variant. The EVE (ne SonicSource) plug-in is a true VST so will work with any DAW or plug-in host you choose to use on the StudioBLADE. Wusikstation and its engine is a great choice as it is well supported, and many sound companies use the platform to develop their own commercial instruments by custom “skinning” the core product, and adding their own sample libraries. Basically, this means you’re not getting a “beta” product from Music Computing, cooked up in a month or two, but something which has many years of popular support and proven usability. SonicSource is nice because it immediately through the GUI supports layering up to three sounds from the fairly large initial library (8GB), and according to the company, they also include the raw samples (sample waveforms) to create your own patches. 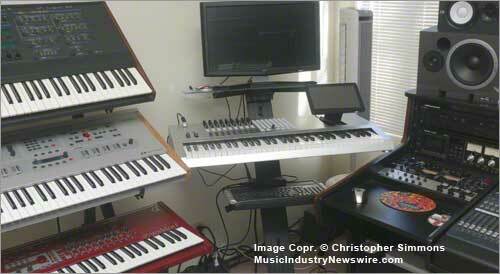 This is not very common, with the possible exception of my Korg Triton Extreme, which also offers this capability. Most instrument makers create patches from the raw sounds, which you can manipulate using the sculpting tools (ADSR, filter cutoff, etc. ), and then you can create layers/splits as multis or combis. Few give you access to the raw samples to go back and create your own base “patches” from (this may be an inherent capability of all Wusik based instruments that don’t copy-protect the waves, but I didn’t look into that for this review). Put another way, this means you could create a much larger personal sound library if you wanted to spend the time to build the patches from scratch yourself, resulting in an almost unlimited number of sound variations. Bundled apps with my unit include NI Guitar Rig LE, and Toontrack EZDrummer Lite, for some additional noise making capabilities. As always, check the Music Computing site prior to purchase for what is included with the system today. I was quite happy to see a full printed manual in the box which has setup information, the full manual for the Presonus hardware and Studio One software, as well as the first how-to guides for the Music Computing applications like TriggerGrid, SonicSource and GeoMIDI. A restore DVD is provided and the Windows license sticker is on the bottom of the case. Also in the shipping box are the external power supply, order receipt, a quick start sheet, license and serial number info for the installed software, box with wireless keyboard and mouse, and mine had a QC checklist for the system assembly. As far as audio I/O and CPU power, I opted for the Intel Core i5 650 processor with 8GB of DDR3 RAM, and two 1TB Western Digital hard drives, plus the Presonus Firestudio Mobile interface with 24/96 support. This provides 2 XLR (or 1/4-inch) TRS combo inputs with switchable phantom power and gain control, plus 6 balanced 1/4-inch outputs, S/PDIF I/O, MIDI I/O, plus one direct keyboard MIDI out. On the right side is an internal DVD/CD burner. Inside the case, the layout of the CPU module, audio modules, I/O, hard drives and cabling is very clean and neat, and the efficient design shows clever use of the off the shelf hardware with some custom I/O. Contrast this with the inside of a NeKo or MiKo which have numerous proprietary circuit boards which would become problematic if Open Labs disappeared one day. The nice thing about looking at the inside of the StudioBLADE is that it’s much like an older car, you can actually figure out what’s going on, and if for some reason Music Computing went into the great long night, it’s actually plausible this gear would live on including replacing the entire CPU module with later and greater computer power. That’s all aces in my book. I’ve been using Windows 7 64-bit for a while now for my personal workstation in my office, and can honestly say it’s the best operating system Microsoft has ever made. If you ever lamented why your PC couldn’t work as well as your Mac, Windows 7 really is that good. With a modern multi-core processor, and the fast operating system and modern RAM, these things really scream. I haven’t used the DAW software (Studio One) included with the StudioBLADE much, but so far it seems robust and I quite like the selection of plug-ins. It’s really a surprising system, and feels very much like a good alternative to Logic or Pro Tools, and there are some quite good tutorial and demo videos on YouTube to show off what it can do. This is a pro application, which becomes apparent when you see all it can do. The Music Computing site doesn’t really do Studio One justice in showcasing the software beyond the bullet points, but the Presonus website has more in-depth feature information to review in advance of making a purchase. The control surfaces are already pre-set to work with Studio One, but the built-in GeoMIDI controller mapping software would allow you to fairly easily map faders and controllers to any other DAW. I loaded Cakewalk Sonar on the StudioBLADE, and it worked very well which would be expected since Sonar Producer Edition has been 64-bit capable for quite some time. Presumably the new version of Pro Tools 9 should work just as well, since Avid branded hardware is no longer a requirement (an iLok dongle still is, however). I tested a few of my favorite Windows apps including Brainspawn Forte, EMU’s Emulator X3, and Sonic Projects’ superb Oberheim virtual instrument clone, OP-X. A couple of hiccups with Forte wanting to run as administrator, and X3 trying to find its own sample library, but these are typical of any virtual instrument. In fact, you will always have a few things in Windows 7 to address with some apps that may require changing the way they launch, or how they write to hard drives other than the boot drive, but it’s a do it once, never again type of thing. Music Computing’s SonicSource VST loaded right into Forte and once I selected the correct audio routing (outs 3 and 4 go to headphones, and 1 and 2 to the speakers), was playing in moments with no hiccups. SonicSource has a fairly respectable selection of bass, keyboard, and real instruments (horns, etc. ), and does provide a great starting point to make music without buying anything else. If you have a lot of older Windows XP era 32-bit VSTs you want to keep using, you should look into possibly using Cakewalk Sonar, as they have one of the most robust “bit bridge” systems to run 32-bit plug-ins inside a 64-bit DAW. There will always be those who say it’s cheaper to buy a MIDI controller keyboard, and a notebook, and hook those together, but that has a lot of trade-offs in data storage, video connectivity, and audio quality. The StudioBLADE is a compelling argument for having it all in one box that you can actually pick up and carry (less than 25 lbs.). Even with a good Gator ATA case, you’d still be under 30 lbs. I’ve always liked the Presonus FireWire modules, and they have the best headphone monitoring I’ve ever had on an audio interface. The only downside here is that the headphone volume control is on the back panel, and the top master volume doesn’t manage that, only the speaker outs; but this can be good in situations where you want or need different control of those elements. You can get the full specs on the Presonus site, and naturally this works very well with the Studio One DAW software. I like the one master MIDI out which is useful if you need to control something like a Dave Smith Tetra or send data to a MPC without attaching the little I/O dongle for the additional MIDI I/O. There are plenty of USB ports (7 USB 2.0), and my unit adds the two FireWire ports. Both a DVI and HDMI output provide a lot of flexibility for connecting up to two additional displays. One network Ethernet connection is included. I was very happy to see that an eSATA port is included as this is the simple way to connect a mirrored RAID array, or even a removable drive system for saving projects on external drives versus the internal disks. eSATA lets you use external drives which are just as fast as if they were internal units, since it’s the same connection speed (much faster than USB or FireWire). 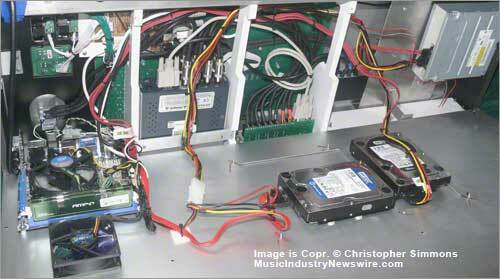 As noted previously, an access panel on bottom allows you to update your hard drive, pull for back-up, etc. New units now shipping also include a second access panel to swap out the entire CPU “module” if needed. Also worth noting is the stylish back-lit Music Computing cut-out logo that glows with the same bluish light as the control surface. After playing with the StudioBLADE a couple of weeks, I have to say I’m fairly impressed. It’s quiet when running aside from occasional hard drive clicks/clacks (normal). The touch panel seemed too small when I got it, but found that it’s the right size to get started, and with the larger 23-inch touch panel (see photos) in use at same time, the small display is ideal for a virtual instrument, or even quick launch buttons for your most used apps. It looks very much at home next to my aluminum Macs in the studio, and somehow seems “right sized” for what it is designed to do. Initially I wasn’t sure of the keyboard action, as the majority of my keyboards have a Fatar action and this uses the latest semi-weighted synth-action waterfall keys from M-Audio. It gives the unit a more premium look with the full-front keys and it’s very playable. I think this type of keyboard “production station” is clearly the wave of the future, as it no longer makes sense to have fixed-in-place ROM based systems that can’t grow as you do. The ability to use the DAW that fits your needs, and not a limited built-in sequencer/recorder, not being limited by storage or memory, or the sounds that fit in the user patch space, is transformational. With some virtual analogs, using SHARC processors, and software like Access Music does with the Virus Ti, allows the product to evolve and add features, but that is a more focused product. With a workstation, you need to be able to make it work with your, well, work. If you’re doing scoring for film or games, you might need to use Adobe Premiere or Sony Vegas, and try loading those into your Roland Fantom (hint: you can’t!). I’ve had a few minor quibbles like the external power supply brick “hanging” in space when plugged into the keyboard on a stand, and my personal sense that the power jack could too easily be knocked out which could be bad during a Windows update. I added a little self-adhesive hook to help hold one end of the cable before it gets to the power input jack, that way if tripped over that hook would catch the stress, and then added a shelf below the keyboard on the Apex stand to put both the power brick and QWERTY keyboard on. I’d also likely consider spraying the anodized aluminum back with a clear coat if I were touring, otherwise scratches will likely ensue. The keyboard action is a matter of taste, as with all keyboards, but I did find the keys on the StudioBLADE (apparently from the M-Audio Keystation “es” series) not as well “sculpted” as those on some of my other synths. Particularly the edges of the key-ends are not as well “rounded” as on, oh, say my Kurzweil, or my Waldorf Q. I “pinched” myself a couple of times playing chords, and while it’s something I could get used to, I prefer the Fatar keybed used on many of the top synth brands and also Novation controllers to the M-Audio “es” series. If you tend to be more of a “poker” than a “player” you will not notice this. It’s a very minor and perceptual thing, so you likely won’t notice it. On the other hand, the benefit of using this key setup is that OS drivers are maintained by Avid and are not dependent on custom code or a circuit board, and easy to fix/replace. On my Apex stand, the audio out jacks are right in the middle where the stand is, so I had to get two “L” adapters for balanced cables to route the cables sideways ($10 total cost). I’m also using an Azio USB Wi-Fi adapter to access my secure wireless network ($15). The only glitch of any kind I had with an interface was the USB port connected to the flip-up touch panel. I have a super high speed OCZ 16GB USB media key, and that caused a power error when I left it attached for an hour. Plugging into any of the back panel ports had no such issue. This is actually a common issue (I have same issue with my Mac wired keyboard I use with my Windows workstation … the hub on the keyboard doesn’t provide enough power). Upshot is that a small 1GB USB memory stick shouldn’t be an issue, the big ones with built-in LEDs and super high speed like my OCZ Rally unit should plug into the back. Being in the first group of customers there were some minor production issues like a screw too long, or the FireWire cable rubbing against back of pitch wheel (easily fixed), and my unit doesn’t have the snazzy second access port on the bottom panel to easily swap memory or replace the entire CPU “module” on the road, but these are works in progress and all the units shipping today incorporate a number of production and finishing touches that the first dozen didn’t have. There was a driver issue with the pitch wheel sometimes sending a CC volume value, and the day after I reported it as a “possible” issue, they sent me a new driver file to install and that fixed it. Tech support has been great in very fast follow up. I’ve gotten follow up phone calls, and e-mails to ensure everything was working well, and the issue was resolved. This is phenomenal support, and bodes well for the company’s rapport with future customers. I’ve also been given the option to send the unit back if I want to get the back panel retrofitted, and they provided some bonus stuff for me due to the initial glitches that more than made up for any headaches. So far, I’m really happy with the StudioBLADE, as it provides me with an easy to use, yet powerful solution for keeping my Windows-based instruments (OP-X doesn’t run on Mac, so can’t use it in Logic Pro, for example, nor does Emulator X3), and is something I would feel comfortable taking to a friend’s house to jam, without having to deal with tangle of wires, interfaces, notebook, and the like (which I also have, and did that once, then never again!). I’ve barely scratched the surface (no pun intended) of what I can do with this, but I look forward to making my ultimate Omnisphere workstation, among other things. 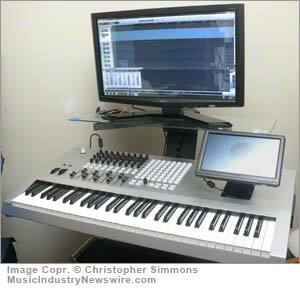 To learn more about the Music Computing StudioBLADE and related products, visit: http://www.musiccomputing.com/ . Article is Copr. © 2011 by Christopher Laird Simmons – all rights reserved. Article originally appeared on MusicIndustryNewswire.com. Thank you for this review. I’ve been researching this board and your review is the absolute best that i have found!